Palestine: Peace Not Apartheid…Jimmy Carter in His Own Words | Democracy Now! Meanwhile, the nation’s newspapers have largely ignored Jimmy Carter’s book since its publication two weeks ago. Carter’s book hasn’t even been mentioned in the news pages of The New York Times, Washington Post, Wall Street Journal, USA Today, Boston Globe or Los Angeles Times. 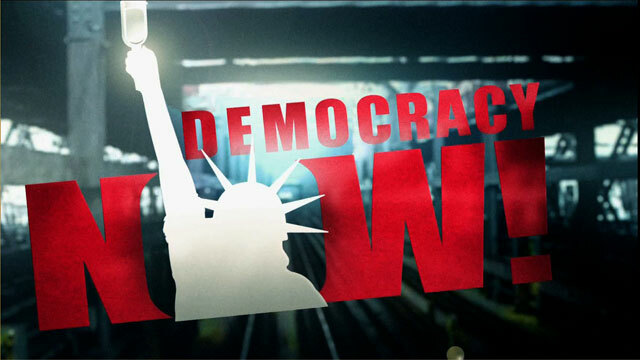 Well, today on Democracy Now!, we’ll hear Jimmy Carter in his own words. On Tuesday night, he discussed his book, Palestine: Peace Not Apartheid, at an event in Virginia. JIMMY CARTER: Some people have said the title is provocative, and I accept that categorization, but I don’t consider the word “provocative” to be a negative description, because it’s designed to provoke discussion and analysis and debate in a country where debate and discussion is almost completely absent if it involves any criticism at all of the policies of Israel. And I think the book is very balanced. Secondly, the words “Palestine: Peace Not Apartheid” were carefully chosen by me. First of all, it’s Palestine, the area of Palestinians. It doesn’t refer to Israel. I’ve never and would imply that Israel is guilty of any form of apartheid in their own country, because Arabs who live inside Israel have the same voting rights and the same citizenship rights as do the Jews who live there. And then the last two words, “not apartheid.” The alternative to peace is apartheid, not inside Israel, to repeat myself, but in the West Bank and Gaza and East Jerusalem, the Palestinian territory. And there, apartheid exists in its more despicable forms, that Palestinians are deprived of basic human rights. Their land has been occupied and then confiscated and then colonized by the Israeli settlers. And they have now more than 205 settlements in the West Bank itself. And what has happened is, over a period of years, the Israelis have connected settlements with highways, and those highways make the West Bank look like a honeycomb and maybe a spider web. You can envision it. And in many cases, most cases, the Palestinians are prevented from using the highways at all, and in many cases, even from crossing the highways. I’d like to make one other point. When Israel was founded back in 1948 by the United Nations, Israel was allocated 56 percent of what we would call “the holy land” between Jordan and the Mediterranean Sea. After the wars, when the Arabs tried to destroy Israel, treaties were worked out, and Israel wound up with 77 percent of the holy land. Twenty-two percent was designated as the West Bank, and 1 percent only, Gaza. So at the optimum case, as recognized by all the United Nations resolutions, Israel would wind up with 77 percent of the area, and the Palestinians only 23 percent, including Gaza and the West Bank. And remember that Gaza is on the sea coast, where the Philistines lived during the time of King David, and it’s separated by 40 kilometers, about 30 miles, from the rest of Palestinian territory. So in order for a Palestinian to go from Gaza to the West Bank, they have to go through 30 miles of Israeli land, though that’s just a geographical description. This book is designed to restimulate the prospect for peace. And I’m going to just read three options that Israelis face. And I’d like to say at the beginning that none of them are completely acceptable to all Israelis. But for the last 40 years, a strong majority of Israelis have preferred to relinquish Arab land in return for peace. And this sentiment prevailed until the time when Prime Minister Rabin was assassinated by an irate Israeli who didn’t like what Rabin and Shimon Peres had done at Oslo in negotiating a peace agreement for which they both received the Nobel Peace Prize. AMY GOODMAN: Former U.S. President Jimmy Carter, speaking in Virginia. We’ll come back to this address in a minute. AMY GOODMAN: We return to the words of former President Jimmy Carter. He was speaking Tuesday night at a book event in Virginia, where he read from his new book, Palestine: Peace Not Apartheid. JIMMY CARTER: Although a clear majority of Israelis are persistently willing to accept terms that are tolerable to most of their Arab neighbors, it is clear that none of the options is attractive for all of the Israelis. And these are the three options. First one has been discussed quite extensively and most persistently by the present prime minister of Israel, Ehud Olmert, who presented this thesis quite early in his career as a young member of the Israeli Parliament — he’s now the prime minister — a forceful annexation of Palestine and its legal absorption into Israel, which would give large numbers of non-Jewish citizens the right to vote and live as equals under the law. So, a large sectarian nation involving both Israelis and Palestinians is this option. This would directly violate international standards and the Camp David Accords, which are the basis for peace with Egypt. At the same time, non-Jewish citizens would immediately make up a powerful swing vote if other Israelis were divided. In other words, if Israelis, who now have a majority, were divided 60-40 or 50-50, as you could see, then if the Palestinians voted as a bloc, they would prevail in establishing the basic policies of Israel, if other Israelis were divided. It would also maybe constitute an outright majority in the new greater Israel. This is because of demographic trends. The Palestinians have a much higher birthrate than do the Israelis, the Israeli Jews. In fact, in Gaza, which I describe, the Palestinian birthrate is 4.7 percent annually, which is the highest in the world. And that means that in Gaza at this time, half their citizens are 15 years old or less. Israel would be further isolated and condemned by the international community. So I think within 20 years or less, in a combined Israel and Palestinian land, the Arabs would actually have a majority, more than the Jews. Second, a system of apartheid — this is, remember, in Palestine — with two peoples occupying the same land but completely separated from each other, with Israelis totally dominant and suppressing violence by depriving Palestinians of their basic human rights. This is a policy now being followed, although many citizens of Israel deride the racist connotation, which I certainly don’t imply, of prescribing permanent second-class status for the Palestinians. As one prominent Israeli stated, quote, “I am afraid that we are moving toward a government like that of South Africa, with a dual society of Jewish rulers and Arab subjects with few rights of citizenship. The West Bank,” this Israel said, “is not worth it.” And that’s a majority — that’s the opinion of a majority of Israelis. An unacceptable modification of this choice now being proposed is the taking of substantial portions of the occupied territory with the remaining Palestinians completely surrounded by walls, fences and Israeli checkpoints, living as prisoners within the small portion of land left to them. I think you can quickly see the unacceptability of both of those options. There’s only one option left, and that is withdrawal to the 1967 border, as specified in U.N. Resolution 242 and as promised legally by the Israeli government in the Camp David Accords and the Oslo Agreement and prescribed in the Road Map of the International Quartet. You remember, the Quartet consists of the United States and Russia and the United Nations and the European Union. Those four comprise a quartet. And they have devised the latest proposal, known as the Road Map for Peace, which has been enthusiastically endorsed by President Bush, as you know. This is the most attractive option and the only one that can ultimately be acceptable as a basis for peace. Good faith negotiations can lead to mutually agreeable exchanges of land, perhaps permitting a number of Israeli settlers to remain in their present homes near Jerusalem inside Palestinian territory. One version of this choice was spelled out in the Geneva Initiative. The Geneva Initiative is described in a separate chapter. I was involved, in some ways, in the preparation of the Geneva Initiative, and I was there and made the keynote speech in Geneva when this initiative was prescribed. But what it does do is work out a compromise between the Palestinians and the Israelis through which about half of the total Israelis who live now in the West Bank could stay where they are, and the others would withdraw, which would still leave the Palestinians with a contiguous — that is, a constant — area of land over which they could have a united government of Palestinians. And also a part of that was a swap of land. Whenever the Palestinians would give up part of their land, where the large Jewish settlements are built, then the Israelis would give up an equal amount of land that might lie just west of Gaza or some parts — relatively uninhabited parts — of Israel. So it was a swap of land for land. The other step was the right of return. This is a very important thing for Palestinians, none of whom would give this up. It’s guaranteed in United Nations Resolution 194. The right of Palestinians to return to their homeland, or either to be compensated for their property if they can prove that they actually have title to that property. And a compromise worked out in the Geneva Initiative was, OK, the Palestinians can return, but they can return only to Palestine. They cannot return to Israel, the new nation of Israel, unless Israelis approve each application for return. But they would still be — have available to them some kind of compensation. And the third major issue — I’m summarizing very quickly — is the settlement of the property, about who controls or owns East Jerusalem. And this is covered quite extensively throughout the book. But a very good compromise was reached, where the holy places would be under the complete control of the Arabs, on the one hand, and the Jews, on the other, including the Wailing Wall and the adjacent land. And then the rest of East Jerusalem would be administered by a joint commission that would take care of housing and schools and garbage collection and water and electricity and that sort of thing. So it was a very good compromise. In my opinion, ultimately something very close to the Geneva Initiative described in this book is the only avenue toward permanent peace for Israel, with justice and peace for their Palestinian neighbors. So the book is deliberately — I wouldn’t say controversial, but it’s deliberately designed to be provocative, because, as I said earlier, in Israel and in Europe, these kind of issues are debated every day, in a most vehement way, particularly in Israel. Pros and cons, arguing back and forth, in the news media, television, radio, the major newspapers. Never, in this country, do you hear any of these issues proposed publicly by an elected member of the House or the Senate or in the White House or NBC or ABC or CBS, New York Times, Washington Post, L.A. Times. Never. And I think it’s time for Americans to start looking at the facts about the Mideast situation. And only then, and based on the knowledge of the facts, will we ever have a chance to move forward and consummate a peace agreement that would give Israel what they need and what they deserve — permanent peace, recognized by their neighbors and all Arab countries and the rest of the world — and the Palestinians to have their human rights, their land and a chance to have their own state, side by side, living in peace with their Israeli neighbors. AMY GOODMAN: Afterward President Jimmy Carter spoke on Tuesday about his book, Palestine: Apartheid Not Peace [sic], he took questions from the audience. He was asked to outline what a balanced U.S.-Middle East policy would look like. Again, his book is called Palestine: Peace Not Apartheid. JIMMY CARTER: Yeah, the word “balance” is one that’s almost unacceptable in our country. If you had a candidate for Congress running either Democratic or Republican and they announced to the general public, “I’m going to take a balanced position between the Israelis and the Palestinians,” they would never be elected. That’s an impossibility in our country. But that doesn’t preclude an incumbent administration from demonstrating with their own actions and words that they are concerned about Israeli peace, they are also concerned about peace and justice for the Palestinians. And that’s what I did. It’s what Richard Nixon did. It’s what Ronald Reagan did after I left office. It’s what George Bush Sr. did. It’s what Bill Clinton did. But it’s not being done now. There is a general feeling throughout the Arab world, throughout Europe, not even noticed in this country, that our present administration has not given any consideration, in my opinion, to the plight of the Palestinians. And you don’t have to be anti-Israel to protect the rights of the Palestinians to have their own land and to live in peace and without being subjugated by an occupying power. So I think that that is a proper approach. If it is impossible during the next two years of President Bush’s administration for him to take that, to use your word, “balanced” approach, then as a fallback, it may be possible for the international quartet to take that role. And that would obviously be the United States playing a major role, but not the only role, and for it to involve the United Nations and Russia and the European Union. And I think they could say, okay, let us orchestrate peace talks based on United Nations resolutions, based on the Camp David Agreement that I worked out, based on the Oslo Agreement, and based on the will of a majority of Israeli citizens, and based on the Road Map that we ourselves have prescribed. By the way, every element of the Road Map has been adopted enthusiastically by the Palestinian side. None of the key elements in the Road Map have been adopted by the Israeli side. They have rejected all of them. And I have the actual action of the Israeli Cabinet in the appendix to this book. So, to summarize, the international group of leaders, the quartet, could take strong action to implement the terms of the Road Map. Thank you all very much, and I will sign a few books. AMY GOODMAN: Former U.S. President Jimmy Carter talking about his new book, Palestine: Peace Not Apartheid.